Judy Snyder has been a trial attorney for more than 40 years. Because of the significant number of cases she has litigated, her firm routinely represents clients in a wide variety of areas of civil litigation - personal injury, medical negligence, legal negligence, wrongful death, employment and civil rights. Although most of Judy’s skills are devoted to representing individuals who are pursuing claims for damages, it is common for her to represent individuals and small businesses who have been sued - successfully defending and aggressively pursuing claims against the parties who filed the litigation. Her cases are filed in the state and federal courts throughout the state of Oregon. As a result of her experience, Judy regularly represents licensed professionals - doctors, psychologists, nurses - before their licensing boards. In 1973 Judy graduated from the University of Notre Dame School of law. She moved to Oregon to clerk for one year for U.S. District Court Judge Otto R. Skopil. Judy then became an aggressive and effective prosecuting attorney in the Multnomah County District Attorneys Office. In 1978, Judy began her firm which focuses on civil litigation in the federal and state courts throughout the state of Oregon. In August of 2001, the Oregon Trial Lawyers Association honored Judy with its Distinguished Trial Lawyer Award. Earlier that year, in March 2001, the Oregon State Bar Litigation Section awarded her the Owen M. Panner Professionalism Award. In August of 2008, Judy became a member of the American Board of Trial Advocates (ABOTA). ABOTA is an invitation-only organization for civil trial attorneys who have significant trial experience and who demonstrate civility, integrity and professionalism in their practice. The mission of ABOTA is, in part, to preserve the constitutional vision of equal justice for all Americans and to preserve our civil justice system for future generations. In 2009 Judy was awarded the Multnomah Bar Professionalism Award. Judy has also been recognized by the legal publications Super Lawyers and Best Lawyers. She has a Martindale-Hubble AV Preeminent rating from her peers. Judy also has served as a leader in numerous professional associations and volunteer boards and agencies. From 1989 to 1990, she served as president of the Oregon Trial Lawyers Association. From 1999 to 2000, she served as president of the Multnomah County Bar Association. 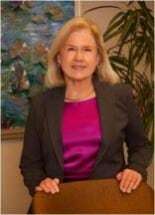 She has also been a long time member of the American Association for Justice, the National Employment Lawyers Association, the Federal Bar Association, and has been active with committees and in various positions with the Oregon State Bar Association. Judy frequently serves as a presenter at Continuing Education programs for attorneys throughout the state. She lectures several times a year on various aspects of trial practice, evidence, trial techniques, and substantive law issues. Judy's community activities have included a four-year term on the State of Oregon's Psychiatric Security Review Board where she was the Chair from 1983 to 1984. She then served on the State of Oregon's Board of Psychologist Examiners from 1986 to 1988. She previously served on the Board of Trustees of Jesuit High School. Judy presently serves on the Commission for Judicial Fitness and Disability.